Campers at Twilight Through the Ages began their timeline journey in Colonial Williamsburg. Times were tough in the 1770’s in Virginia. Without electricity, thee girls discovered how hard daily life could be. 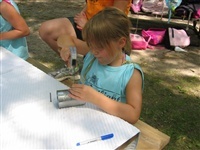 Each girl was able to design their own tin can lantern using a hammer and nail. The girls loved the “hand’s on” activity using these simple hand tools. The advancement in technology was further explored during a partnership with the Bakken Museum as they presented a workshop on Benjamin Franklin’s discovery of the lightning rod. A simple snack of gingersnaps and apple cider from was offered. Colonial cooking was discussed as was a story board from the era highlighting historic women of the day and a detailed account of how a lady would get dressed…all nine steps of it! 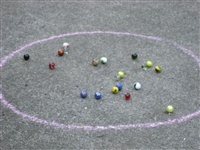 Traditional games of the day were marbles and hoop and stick. 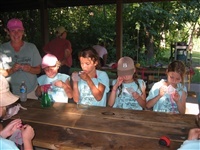 All campers received their own set of glass marbles and learned basic rules to play a simple game while at camp. They also were introduced to the concentration and skill required to play hoop and stick. Much fun was had by all those who experienced these games played so long ago by children in Colonial Williamsburg. While in Colonial Williamsburg, girls learned about our founding community members, the advancement of electricity, simple children’s games, were able to use basic hand tools and learned about the advancement of women in an important era of American history. The Roaring Twenties were filled with many changes. Campers learned about some of the women of the time including The Unsinkable Molly Brown, Marie Curie, Carrie Chapman Catt, Bessie Coleman and Amelia Earhart and, of course, Juliette Gordon Low. These women pioneers, and their dedication to advancing the women’s movement in America, coupled with the many inventions and fads, mass production and more gave the Roaring Twenties area at Twilight Through the Ages many opportunities to experience! With advancements in technology we transitioned from the Victrola to the iPod in one smooth movement. 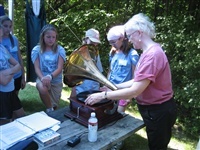 An antique Victrola was loaned to Twilight Camp by a local estate. Campers had the rare opportunity to see how one worked and to their surprise, a hidden iPod and speakers brought forth popular tunes such as “Charleston” and “Yes, Sir, That’s My Baby”! With help from local dance school members, campers were taught the Charleston and had the props of strands of pearls and fedoras to help add to the spirit! Mass assembly was on site. Campers in units were given cards with their assembly instructions written on them. As their work was needed, they added to the product, eventually assembling a catapult for water balloon launching. Girls loved using tools, creating something and adding their portion of work to a group effort…and especially launching a water balloon a hot summer day! After a shift on the assembly line, units of campers were able to become designers in the fashion industry. A fashion studio was available for designers to create their own paper doll fashions and learn about the fashion changes women went through during this era in history. Many styles of dress and accessories were on display on life-sized banners in this area. To cool off, campers were treated to a break at a lunch counter. While visiting this area, they worked together in small groups to create their own malted milk shakes. Ice cream, milk and special add-in’s were mixed together and served to each individual in the group in celebration of the famous ice cream favorite still enjoyed today. 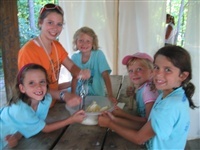 At this site, campers were encouraged to work together on the assembly line, work individually in creating their own fashion designs, fix a sweet treat for each other and step outside of their comfort zone by learning to dance! Pioneer era was a hard time period in American history. At this area of camp, girls were introduced to some basic outdoor skills…chopping wood and building a fire. 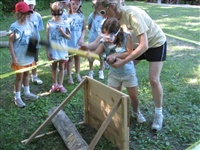 With one-on-one adult supervision, all campers with permission to participate had the opportunity to chop wood. Every safety precaution was taken to ensure everyone in the area would be safe during this activity. Girls donned safety goggles and work gloves, stood with an adult behind a security protection board in a corded off area and swung an axe! This was one of the most exciting areas of Twilight Through the Ages! Campers hauled wood and built their own traditional “edible fire” while learning about cooking over an open fire in the Pioneer days. The advancement in cooking was a huge surprise to many campers who also learned not only did Pioneer women have to haul and chop wood for cooking but they also did it for washing clothes, bathing and cleaning in addition to working in their fields and taking care of their families. 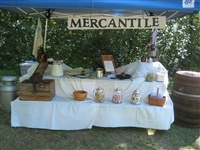 Campers had the chance to visit a local mercantile to shop for goodies. This area was stocked with authentic antique kitchen gadgets, large canisters of beans and rice and a corn shucker where they were each able to crank an ear of feed corn, shell the kernels and produce a cleaned cob! Campers each received a brown paper handle bag and were allowed to shop for treats from large glass jars of traditional candies…licorice, gum, candy sticks. They each received a metal harmonica and harmonica lessons from a local musician who was on site during camp. Hand sewing was introduced in the Pioneer area. Campers were given basic instruction on sewing and created their own patterns with yarn and needle on plastic sewing canvases. Several types of needle art were displayed including hardangar, needle point, cross stitch and embroidery. 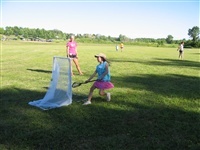 With help from the Chaska High School Girls Lacrosse team, this Native American game was taught to our campers. The dexterity and skill required to play this traditional and still popular field game was a great way to show the campers how working and playing together really helped form great bonds within different communities during this historic era. After a long day as Pioneers, the campers were able to relax and enjoy honey butter on fresh baking powdered biscuits and a cold ginger ale drunk from a glass mason jar. Served family-style at long picnic tables in the shade, this was a great ending to a wonderful day exploring the Pioneers of America. At this site, girls learned to work on a team as well as individually, they were able to try using an axe, learned basic sewing skills and all about the hard lives women lead in the 1870’s. Our final stop on the Twilight Through the Ages time line was in the Groovy 1970’s. Again, an era rich in changes, this area of camp was filled with fun activities of days gone by and brought back many happy memories to the adult volunteers on hand. Many household items and electronic devices from the Groovy 1970’s were compared to the modern day equivalent. Many campers had never seen a rotary dial telephone, an 8-track player or music album. Toys were borrowed from adult volunteers so the campers could see what many children, not so long ago, considered entertaining and fun ways to pass the time (a/k/a “playing”). A themed “What’s that 70’s Thing?” game show was played where campers on teams were posed a question about a thing from that by-gone era and what it was called…very funny responses and a great learning tool! No 1970’s site would have been complete without the favorite tie-dye craft from the past. Bandanas were tie-dyed the modern way with spray dye rather than the old-fashioned procedure of dipping fabric into liquid dye. Our technique was a wonderful and very easy method for the campers to achieve the same results in a brief period of time without the mess! To chill out and relax, campers visited a yoga area. Off to the side of the other activities, yoga mats under a large canopy invited campers to sit, breathe deeply and enjoy the natural beauty of the park area. Each camper was given a Sun Salutation instructional booklet to take home. Healthy eating habits, daily exercise and relaxation were all encouraged both while at camp as well as afterward. A fun game of Twister was played after everyone was limber! There’s nothing like cooling off after a hot summer day than to sip ice cold lemonade and have a snack with your friends. Fresh, cold batches of Country Time lemonade were served with hot buttery Jiffy Pop popcorn…as much fun to make as it is to eat! Each camper was given a pitcher-sized packet of lemonade to take home after camp, make for their family, and sit back and tell tales from a wonderful week at Twilight Through the Ages! 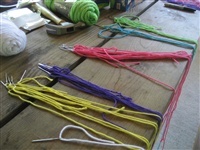 While at this site, campers worked on teams for the game show and individually in creating their own tie-dye bandanas. 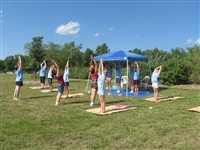 Campers engaged with adult volunteers to learn the importance of healthy life skills and were introduced to yoga. The Groovy 1970’s were a blast and all campers agreed they loved the retro-snacks and cool feel of the great activities offered to them in the Groovy 1970’s. Over 900 photos from Twilight Camp 2008 are available for viewing, downloading, and ordering prints. Photos are grouped into albums by camp activity. See the menu to the right of each album and photo for viewing, downloading, and ordering options. You need a Shutterfly, Kodak Gallery, or Snapfish account to order prints directly from the site - otherwise just download and print like you would any other digital photo. Twilight thru the Ages won the Girl Scouts of Minnesota and Wisconsin Rivery Valleys 2008 Extraordinary Event Award for the Northern Skies Service Unit. 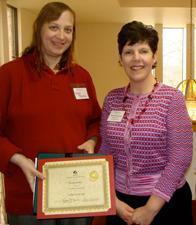 Camp Directors Treva Bjerke and Barb Scharfenberg were recognized at the 2009 Awards Dinner.